Image Copyright Little Blue Hen. A few weeks ago I posted a recipe for Orange Glazed Tempeh. I showed the recipe to my husband and he said to me, “That’s great! What’s Tempeh?”. That made me think, perhaps I should tell you what I’m so in love with. Let’s get to know tempeh (pronounced TEM-pay). 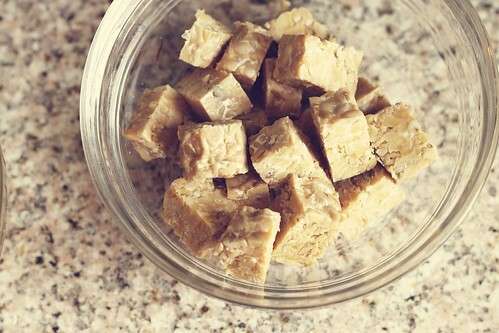 Tempeh is made by fermenting whole soybeans with a grain, usually rice. It is sold in flat rectangles or squares. 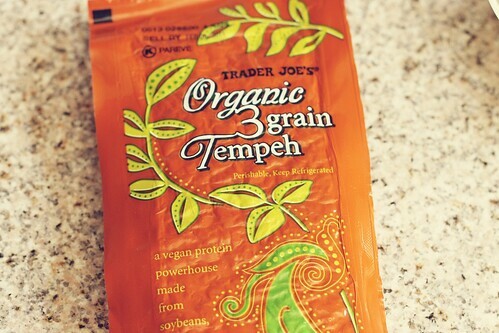 I buy mine at Trader Joe’s, I am a fan of the Trader Joe’s Organic 3 Grain Tempeh, I can get this for $1.79 at my store. Tempeh’s texture is dense and chewy and has a nutty flavor. It is advised to steam tempeh for 10 minutes before cooking it to dull the bitter flavor. I will be honest, I have not steamed tempeh, perhaps it’s a personal choice. If you find that tempeh is too bitter, steam it. What can you make with tempeh? First you can make orange glazed tempeh or try making tempeh bacon with this recipe from Compassionate Cooks. You can use it in many recipes in place of meat or tofu. It works well with a marinade and sauteed until golden. For more recipes click here. Have you tried tempeh? Are you planning to give it a go? What are your favorite tempeh recipes? I’d love to hear your thoughts.